Hewitt’s trademark clarity of line, and her technical control which never limits the expression of passion, are clearly in evidence. She is supported by the Deutsches Symphonie-Orchester Berlin and the brilliant Finnish conductor Hannu Lintu. A fascinating commentary by Hewitt herself completes this album which is sure to delight her ever-increasing legion of fans. When Robert Schumann left his native Zwickau at the age of eighteen to study law in Leipzig, he still didn’t know exactly what he wanted to do with his life. His father, a successful bookseller, had died suddenly two years previously, and in his will left an extra 200 thalers a year to Robert if he attended university—something his three elder brothers had never done. The only musical member of his family, Robert started learning the piano at the age of seven with the town organist, Johann Gottfried Kuntsch, whose lessons Schumann later described as useless. Until he arrived in Leipzig he was largely self-taught. Hardly a prodigy, he did make his mark as an improviser, and as a child he liked to illustrate the personalities of his friends with musical portraits at the piano. It is amazing to discover that he never heard a symphony orchestra until he was seventeen years old, and that he did so only by going to Dresden. He needed to get out of provincial Zwickau, and moving to Leipzig was his means of escape. The fact that the lady he was desperately in love with at the time—Agnes Carus, a married woman eight years his senior and a singer with whom he had discovered the lieder of Schubert—was also about to move there didn’t hurt. What Schumann did know, or at least soon realized, was that if he wanted to be a composer he had to be able to play his own works. Mendelssohn, Liszt, Chopin, Thalberg—all of these contemporaries were virtuosi who wowed audiences not just with their compositions but with their own playing as well. Soon after Schumann arrived in Leipzig, he began taking lessons with Friedrich Wieck, who made him start back at the beginning with boring finger exercises that had to be endlessly repeated. Schumann had always wanted to do things his own way, and this couldn’t have been easy for him. It also couldn’t have been easy seeing Wieck’s daughter Clara at the tender age of eight already playing the A minor concerto by Hummel that he himself was struggling to learn. After two years of studying law in Leipzig and Heidelberg (with a trip to Italy thrown in for diversion), Schumann finally realized that music had to be his life. His family was not pleased. Wieck took him on as a full-time student and lodger. But a year later Schumann began to experience numbness in his right hand. What now would be regarded as repetitive strain injury was then much less understood, and by 1832 Schumann realized that he would never be a pianist. He would have to be satisfied simply as a composer. During those years as a young student, Robert had tried his hand at composing a piano concerto, and got as far as almost completing the solo part of one in F major. He also attempted to turn his Opus 1, the Abegg Variations, into a work for piano and orchestra, but again left it incomplete. We now know that it was he who orchestrated the finale of Clara’s own piano concerto, written when she was just fourteen years old. In early 1839, when Robert and Clara were fighting her father’s opposition to their engagement, he tried again to compose a piano concerto while in Vienna. Clara, writing from Paris where she was undertaking a concert tour as a final obligation to her father, gave him further encouragement: ‘Please do not hold it against me, dear Robert, when I tell you that I have a strong desire for you to write for orchestra as well. Your imagination and your spirit are too grand for the frail piano. See if you cannot accomplish such a thing?’ He did try, but again was unsuccessful in completing it. His description of the attempt, however, is prophetic. Calling it something ‘between a symphony, concerto and grand sonata’ he could have been describing the work that was later to become the first movement of his Piano Concerto in A minor, Op 54. In September 1840 Clara and Robert finally married. After years of producing one masterpiece for solo piano after another (his first twenty-three opus numbers are solo piano works) he turned gloriously to song, and in the space of a single year wrote something like 168 of them. Alongside his composing, he was editor of the Neue Zeitschrift für Musik. This didn’t bring in much income, and he knew the time had come to prove himself with a big symphonic work. His first success in that field came with his ‘Spring’ Symphony, sketched in just four days and premiered at the Gewandhaus on 31 March 1841 with Mendelssohn conducting. It seems, however, that nobody much wanted a one-movement work. Despite many attempts, a publisher could not be found and the work was put aside. Another four years passed before Schumann worked on it again. He generally immsersed himself in one genre at a time, and 1842 was his year for chamber music. His Piano Quintet Op 44, with its virtuoso piano part, served as a pseudo-concerto for Clara, still awaiting the real thing. In 1843 Schumann devoted himself to large-scale choral works, and the following year Robert and Clara undertook a five-month tour of Russia. Robert was seriously ill for some time after his return from Russia, and at the end of 1844 they moved to Dresden in order to find more peace and quiet to work. When Schumann did finally turn his attention to his piano concerto once more, he started by composing the third movement finale, calling it a Rondo. Only after completing that did he write the Intermezzo that connects this with the original first movement (which he then revised). It also seems that the bridge passage connecting the Intermezzo with the Rondo gave him particular trouble (there exist seven different versions). We are all so familiar with this music now that it seems so evident, but it wasn’t arrived at easily. John Worthen in his excellent biography of Schumann notes how ironic it was that Schumann finally gave Clara ‘her’ concerto at a time in her life when she could hardly practise. By now she had three children and knew a fourth was on its way (she was pregnant ten times in fourteen years), and because Robert needed silence to compose she could only practise when he took his afternoon walk. Often she was too exhausted by that time to get much work done, and her performances were not frequent. But finally she had her concerto, and the first performance was given in the Hôtel de Saxe in Dresden on 4 December 1845. Ferdinand Hiller, to whom the concerto is dedicated, conducted the orchestra of the subscription concerts. The concerto was a success, as was confirmed by the review in the Allgemeine Musikalische Zeitung: ‘We all have reason to hold this composition in very high esteem and place it among the best by this composer, primarily because the usual monotony of the genre is happily avoided and the entirely obbligato orchestra part, fashioned with great love and care, is given its full due without leaving the impression of impairing the piano’s achievements, and both parts keep up their independence in a beautiful alliance.’ The second performance (although it is often referred to mistakenly as the premiere) was given in the Leipzig Gewandhaus on New Year’s Day 1846. There seems to be some confusion over who conducted: some sources say Mendelssohn, others say Niels Wilhelm Gade, who shared the conductor’s duties at the time with his illustrious colleague. Few pieces attract the attention of the audience so quickly as this concerto. As Michael Steinberg so vividly writes: ‘The orchestra fires the starting gun, a single eighth-note [quaver] E, and the piano moves out of the blocks with a powerful cascade of fully voiced chords.’ The soloist, in fact, hardly stops playing during the entire concerto. The winds are given the initial statement of the opening melody, one in which the ‘Clara’ motif of descending notes—abundantly used throughout Schumann’s piano works—is fully apparent. There is no change of tempo marking here, even if the ‘tradition’ is to slow down. The subsequent piano entry of the theme is powerfully expressive but intimate at the same time. The dialogue between piano and orchestra is constant, each taking their turn to be soloist and accompanist. This is most striking in the slower passage, marked Andante espressivo, in the middle of the first movement—a magical moment of repose, where the clarinet and piano are the featured soloists. It is interesting to compare the piano part in the central Più animato with what remains of that early Phantasy in A minor, where the writing is a lot more difficult in the later version. Perhaps Clara complained that it wasn’t showy enough? The written-out cadenza is perfectly paced, and gave Clara the chance to shine. It begins with counterpoint, goes through some recitative-like passages, gains huge momentum with a brilliant outburst of chords over descending octaves, and returns passionately to the opening theme. From there the cadenza dissolves into a trill, but ends not with the standard cadence but rather leads directly into the re-entry of the orchestra, now giving us the theme much faster but in hushed tones. The crescendo to the final, uncompromising chords is dramatic to say the least. I will never forget the time I performed it for an audience of school children, and one very young boy, immediately after the last chord, let out a spontaneous ‘Wow!’. I think Schumann would have been pleased with that. Having written the last movement next, it is understandable that Schumann didn’t want anything too ‘meaty’ for the ‘slow’ movement, when he finally got round to composing it. After the drama and shifting moods of the first movement, a short Intermezzo seems just the thing. Here, the notes of the first movement’s descending motif are turned upside down and now go upwards, but the chamber-music feeling continues and is even amplified. The clarinet again features strongly, but so does the cello section, called upon to give us a ‘big tune’. So often this central section can become distorted, wallowing in sentiment rather than retaining its confidentiality. The bridge that Schumann finally settled on to link the Intermezzo with the finale returns to the ‘Clara’ motif, first in the major, then in the minor, before bursting into the theme of the Allegro vivace. Here the ascending notes create a sense of unbounded joy. This movement, in my opinion, is often taken far too fast; Schumann’s metronome marking of 72 to the dotted minim seems entirely apt for once, especially if you want to bring out its waltz-like character (the coda especially has a terrific swing to it). The first time I ever performed this concerto was in the finals of the Schumann Competition in 1976, held in Zwickau (Schumann’s birthplace). The conductor of the orchestra from nearby Halle was determined that none of the finalists would take this third movement too fast, and to this day I can still see him leaning over me, terrifyingly beating in a strict tempo and preventing any possibility of rushing. All the passagework in the piano part must sing and be heard. 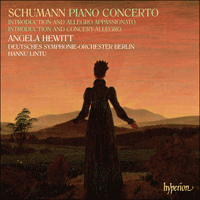 All that scurrying about (as it so often sounds like) in different keys during the most difficult moment of the concerto—where Schumann inserts a prime example of his beloved rhythmic games, terrifying every conductor, even Mendelssohn himself it seems—must sound easy and coherent. And danceable. But what an exhilarating piece of music it is. Clara waited a long time for it, but it was worth it in the end. It’s curious that Schumann’s writing for piano and orchestra seems to have occurred about every four years: the Phantasy in 1841; the remainder of the Piano Concerto in 1845; and the two separate pieces for piano and orchestra in 1849 and 1853 respectively. The Introduction and Allegro appassionato, Op 92, was sketched in just two days in September 1849, and the full score finished a week later. Clara got her hands on it right away, but at its premiere the following February in Leipzig she wasn’t feeling well and it was a flop. The second performance in Düsseldorf a month later, with her husband conducting, was a resounding success. Still, it remained neglected for some time, which is a pity because the magical introduction alone makes it worth hearing. Schumann was immersed in Byron’s dramatic poem Manfred at the time (resulting in his Manfred Overture), and some of its urgent despair can also be heard in the opening theme of the Allegro. At one point the theme of the introduction returns in B major in a passage that, if you were to hear it by itself, would make you think of Brahms. Schumann, however, hadn’t yet met the young Johannes Brahms. He was to appear on the doorstep of the Schumann household a few weeks after Clara’s thirty-fourth birthday, in 1853. As a present Robert had given Clara not only a new grand piano, but had placed on top of it the manuscript of his new Introduction and Concert-Allegro, Op 134. Her joy was boundless. The short introduction opens with pizzicato chords in the orchestra, interrupted by the piano with a lyrical theme in triple metre that will reappear in the Allegro with an extra beat added. 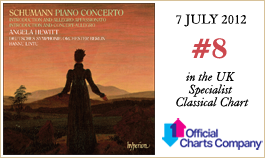 In the Allegro, a new theme is introduced by the pianist which is of a tenderness that only Schumann could produce. An extended cadenza takes up almost a quarter of the entire piece and is a wonderful rhapsody on the material already presented. The first performances were given by Clara in Holland (Utrecht, The Hague, Amsterdam) in November–December 1853 with Robert conducting. Less than three months later Robert tried to commit suicide by throwing himself into the Rhine and was subsequently placed in the asylum at Endenich. Clara was not allowed to visit him; but Brahms went, and during one of his visits in February 1855 Schumann wrote in his notebook that Op 134 was to be dedicated to him. Brahms wrote to Clara: ‘You know quite well what delight your husband has given me in dedicating this particular work to me. This and the Violin Fantasy [Op 131] are the concertos of his which I love the most.’ After her husband’s death the following year Clara no longer performed the piece, but Brahms did so in Vienna in 1869. Lorsque Robert Schumann quitta son Zwickau natal, à l’âge de dix-huit ans, pour aller étudier le droit à Leipzig, il ne savait pas encore vraiment ce qu’il voulait faire de sa vie. Son père, un libraire prospère, était mort brutalement deux ans auparavant et, par testament, lui avait légué un supplément de deux cents thalers annuels s’il allait à l’université—ce qu’aucun de ses trois frères aînés n’avait jamais fait. Seul musicien de sa famille, Robert commença le piano à l’âge de sept ans, avec l’organiste municipal Johann Gottfried Kuntsch, dont il qualifiera plus tard les leçons d’inutiles. Ce fut donc essentiellement en autodidacte qu’il arriva à Leipzig. Il était tout sauf un prodige et il s’imposa dans l’improvisation; enfant, il aimait illustrer la personnalité de ses amis par des portraits au piano. On s’étonne d’apprendre qu’il n’entendit aucun orchestre symphonique avant l’âge de dix-sept ans, encore fut-ce au prix d’un voyage à Dresde. Il lui fallait se sortir du provincial Zwickau et partir à Leipzig fut son échappatoire. Le fait que la dame dont il était alors éperdument amoureux—Agnes Carus, une chanteuse mariée, de huit ans son aînée, avec qui il avait découvert les lieder de Schubert—fût sur le point de s’y installer ne gâcha rien à l’affaire. Ce que Schumann n’ignorait pas, ou du moins ce qu’il ne tarda pas à réaliser, c’est que s’il voulait devenir compositeur, il devait être capable de jouer ses propres œuvres. Ses contemporains Mendelssohn, Liszt, Chopin et Thalberg étaient tous des virtuoses à même d’éblouir leur auditoire et par leurs œuvres et par leur jeu. Peu après être arrivé à Leipzig, il commença à prendre des leçons avec Friedrich Wieck, qui lui fit tout reprendre à zéro, avec de barbants exercices pour les doigts à répéter inlassablement. Lui qui avait toujours voulu faire les choses à sa manière dut trouver cela pénible, tout comme il dut souffrir de voir Clara, la fille de Wieck, jouer, à l’âge tendre de huit ans, le concerto en la mineur de Hummel, qu’il s’escrimait alors à apprendre. Après deux ans de droit à Leipzig et à Heidelberg (avec, en prime, une excursion en Italie, pour se distraire), Schumann prit enfin conscience que sa vie devait être musique. Sa famille n’en fut pas ravie. Wieck le prit en pension, comme élève à plein temps. Mais un an plus tard, Schumann se mit à éprouver un engourdissement de la main droite. Ce qu’on considérerait aujourd’hui comme une blessure de fatigue répétitive était alors beaucoup moins bien compris et, en 1832, Schumann réalisa qu’il ne serait jamais pianiste. Il lui faudrait se contenter de la composition. Pendant ses études, Robert s’était essayé au concerto pour piano, allant jusqu’à presque achever la partie solo d’un concerto en fa majeur. Il tenta aussi de transformer son op. 1, les Variations Abegg, en une œuvre pour piano et orchestre qu’il laissa, là encore, inachevée. On sait aujourd’hui que ce fut lui qui orchestra le finale du Concerto pour piano rédigé par Clara à tout juste quatorze ans. Au début de 1839, en lutte contre Wieck père pour pouvoir se fiancer à Clara, il refit, à Vienne, un essai de concerto pour piano. Dans une lettre écrite à Paris, où elle effectuait une tournée de concerts—ultime engagement envers son père—, Clara l’encouragea encore: «Ne m’en veux pas, cher Robert, quand je te dis que j’éprouve le vif désir de te voir écrire, toi aussi, pour orchestre. Ton imagination et ton esprit sont trop grands pour le frêle piano. Vois donc si tu ne le pourrais pas?» Il essaya vraiment mais il ne put, là encore, aller jusqu’au bout et fit de cette tentative une description prophétique: elle «tient le milieu entre la symphonie, le concerto et la grande sonate»—des mots qu’il aurait tout aussi bien pu appliquer à ce qui allait être le premier mouvement de son Concerto pour piano en la mineur op. 54. En septembre 1840, Robert épousa enfin Clara. Après des années passées à enchaîner les chefs-d’œuvre pour piano solo (ses vingt-trois premiers numéros d’opus s’adressent à cet instrument), il s’attaqua glorieusement au lied—il en écrivit quelque chose comme cent soixante-huit en un an. En plus de composer, il était rédacteur en chef de la Neue Zeitschrift für Musik. Cela ne lui rapportait guère, et il savait que l’heure était venue de faire ses preuves avec une grande œuvre symphonique. Son premier succès en la matière fut sa symphonie «Printemps», ébauchée en quatre petits jours et créée au Gewandhaus, sous la direction de Mendelssohn, le 31 mars 1841. Il semble toutefois que personne n’appelait de ses vœux une telle œuvre en un mouvement. Malgré maintes tentatives, trouver un éditeur fut impossible et l’œuvre fut laissée de côté. Quatre années s’écoulèrent avant que Schumann la reprît. En général, il s’immergeait dans un seul genre à la fois et 1842 fut son année «musique de chambre». Le Quintette op. 44, avec sa partie de piano virtuose, servit à Clara de pseudo-concerto, en attendant le vrai. En 1843, Schumann se consacra à de vastes œuvres chorales et, l’année suivante, il entreprit avec Clara une tournée de cinq mois en Russie. Quelque temps après son retour, il tomba gravement malade et, à la fin de 1844, le couple emménagea à Dresde, en quête de paix et de calme pour travailler. Lorsque Schumann se replongea enfin dans son concerto pour piano, il commença par composer le finale du troisième mouvement, qu’il baptisa Rondo. Il attendit de l’avoir terminé pour écrire l’Intermezzo qui le relie au premier mouvement original (qu’il révisa alors). Le pont entre l’Intermezzo et le Rondo lui posa aussi, semble-t-il, bien des problèmes (il en existe sept versions). Cette musique nous est aujourd’hui tellement familière qu’elle nous paraît couler de source, mais elle s’est faite dans la douleur. Ironiquement, souligne John Worthen dans son excellente biographie, Clara reçut «son» concerto à un moment où elle ne pouvait plus guère pratiquer le piano. Déjà mère de trois enfants, elle se savait enceinte d’un quatrième (elle connaîtra dix grossesses en quatorze ans) et, Robert ayant besoin de silence pour composer, elle ne pouvait s’exercer que l’après-midi, quand il partait se promener. À cette époque, elle était souvent trop épuisée pour faire grand-chose et elle se produisait peu en concert. Mais elle finit par avoir son concerto à elle, qui fut créé à l’Hôtel de Saxe, à Dresde, le 4 décembre 1845. Ferdinand Hiller, dédicataire de l’œuvre, dirigea l’orchestre des concerts par abonnement. Le concerto fut un succès, comme en atteste cette critique parue dans l’Allgemeine Musikalische Zeitung: «Nous avons toutes les raisons de tenir cette composition en très haute estime et de la ranger parmi les meilleures de son auteur, surtout que l’habituelle monotonie du genre nous est, par bonheur, épargnée et que toute la partie d’orchestre obligé, ouvragée avec beaucoup d’amour et de soin, reçoit ce qui lui revient, sans donner l’impression de porter atteinte à la prestation du piano, et les deux parties conservent leur indépendance en une belle alliance.» La deuxième exécution (souvent confondue, à tort, avec la première) eut lieu au Gewandhaus de Leipzig, le jour de l’an 1846. Il y a apparemment une incertitude quant à l’identité du chef d’orchestre: certaines sources évoquent Mendelssohn, d’autres Niels Wilhelm Gade, qui partageait alors les fonctions de chef avec son illustre collègue. Peu de pièces attirent l’attention du public aussi vite que ce concerto. Pour reprendre les mots si frappants de Michael Steinberg: «L’orchestre tire la première salve, une seule croche de mi, et le piano émerge avec une puissante cascade d’accords tonitruants.» Le soliste, au vrai, ne cesse guère de jouer d’un bout à l’autre du concerto. Aux vents revient l’énonciation première de la mélodie inaugurale, qui laisse pleinement apparaître le motif de «Clara», en notes descendantes, dont Schumann usa abondamment dans son œuvre pianistique. L’indication de tempo demeure inchangée, même si la tradition veut qu’on ralentisse. L’entrée suivante du thème, au piano, est ensemble puissamment expressive et intime. Le piano et l’orchestre dialoguent constamment, chacun se faisant tour à tour soliste et accompagnateur, comme l’illustre, de manière on ne peut plus saisissante, le passage ralenti, marqué Andante espressivo, au milieu du premier mouvement—magique instant de repos avec, pour solistes, la clarinette et le piano. Il est intéressant de comparer la partie de piano du Più animato central avec ce qu’il reste de la Fantaisie en la mineur, à l’écriture bien plus difficile que dans la version ultérieure. Peut-être Clara se plaignit-elle d’un manque d’ostentation? La cadenza écrite en toutes notes, au rythme parfait, lui donne l’occasion de briller. Elle part sur un contrepoint, emprunte des passages façon récitatif et prend un immense élan via une brillante explosion d’accords par-dessus des octaves descendantes avant de revenir passionnément au thème inaugural. Puis elle se dissout en un trille, sans pour autant s’achever sur la cadence standard, puisqu’elle débouche directement sur la ré-entrée de l’orchestre pour nous donner le thème bien plus rapidement, mais tout bas. Le crescendo menant aux derniers accords inflexibles est pour le moins théâtral. Je n’oublierai jamais la fois où je l’ai joué devant un public d’écoliers et où, juste après le dernier accord, un tout petit garçon a lâché un «super!» spontané. Schumann aurait, je pense, aimé cela. Ayant ensuite écrit le dernier mouvement, Schumann ne voulait pas, on peut le comprendre, quelque chose de trop «riche» pour le mouvement «lent», quand enfin vint l’heure de le composer. Après le drame et l’atmosphère changeante du premier mouvement, un court Intermezzo semble idéal. Les notes du motif descendant du premier mouvement, renversées, deviennent ascendantes, mais la sensation de musique de chambre se poursuit, s’amplifie même. La clarinette a, là encore, une forte présence, et la section des violoncelles aussi, d’ailleurs, qui doit nous donner un «grand air». Cette section centrale peut si souvent se dénaturer, se complaire dans la sentimentalité au lieu de garder sa confidentialité. Le pont que Schumann jette finalement entre l’Intermezzo et le finale renoue avec le motif de «Clara», d’abord en majeur, puis en mineur, avant de se précipiter dans le thème de l’Allegro vivace. Les notes ascendantes suscitent là un sentiment de joie sans bornes. Je pense que ce mouvement est souvent pris trop vite: l’indication métronomique de Schumann (72 par rapport à la blanche pointée) semble, pour une fois, parfaitement adaptée, surtout si l’on veut faire ressortir le caractère de valse (la coda, notamment, a un swing terrible). La toute première fois que j’ai joué ce concerto, c’était lors de la finale du Concours Schumann, en 1976, à Zwickau (lieu de naissance du compositeur). Le chef de l’orchestre de Halle, non loin, était bien décidé à ce qu’aucun finaliste ne prît ce troisième mouvement trop vite et je le revois encore, penché au-dessus de moi, battant effroyablement la mesure dans un tempo strict pour empêcher toute velléité de précipitation. Tous les passages de la partie de piano doivent chanter et être entendus. Toute cette précipitation (cela y ressemble si souvent), dans différentes tonalités, au moment le plus difficile du concerto—où Schumann insère un parfait exemple de ses chers jeux rythmiques, terreur de tout chef d’orchestre, y compris, semble-t-il, de Mendelssohn—, doit sonner facile, cohérente. Et dansable. Mais quelle musique exaltante. Clara l’a attendue longtemps, mais cela en valait la peine. Curieusement, Schumann se mit à écrire pour piano et orchestre à peu près tous les quatre ans: la Fantaisie en 1841; le reste du Concerto pour piano en 1845; et les deux pièces pour piano et orchestre, en 1849 et 1853 respectivement. L’Introduction et Allegro appassionato op. 92 fut esquissée en seulement deux jours de septembre 1849 et la grande partition fut achevée une semaine plus tard. Clara s’en empara immédiatement mais lors de la première à Leipzig, en février suivant, elle ne se sentit pas bien et ce fut un flop. La deuxième exécution, qui se déroula à Düsseldorf, un mois plus tard, sous la baguette de Robert, fut un succès retentissant. Cette œuvre demeura pourtant quelque temps dans l’oubli, ce qui est dommage car elle vaut le coup d’être écoutée rien que pour son introduction magique. À l’époque de sa rédaction, Schumann était plongé dans Manfred, le poème dramatique de Byron (il en ressortira son ouverture Manfred), et le thème liminaire de l’Allegro exsude un peu de son désespoir instant. À un moment, le thème de l’introduction revient en si majeur dans un passage qui, entendu tout seul, ferait penser à Brahms. Mais le jeune Johannes Brahms n’était pas encore apparu à la porte des Schumann: il ne le fera que quelques semaines après le trente-quatrième anniversaire de Clara, en 1853. Ce jour-là, Robert avait offert à sa femme un piano de concert neuf, sur lequel il avait disposé le manuscrit de sa nouvelle Introduction et Concert-Allegro op. 134. Clara fut aux anges. La courte introduction s’ouvre sur des accords orchestraux en pizzicato, que le piano vient interrompre avec un thème lyrique en mesure ternaire—lequel resurgira dans l’Allegro avec un temps de plus. Dans ce même Allegro, le pianiste introduit un thème d’une tendresse dont seul Schumann avait le secret. Une cadenza prolongée reprend presque un quart de la pièce et est une merveilleuse rhapsodie sur le matériau déjà présenté. Les premières exécutions furent assurées par Clara en Hollande (Utrecht, La Hague, Amsterdam) en novembre–décembre 1853, avec son mari à la baguette. Moins de trois mois plus tard, Robert tenta de se suicider en se jetant dans le Rhin et fut interné à l’asile d’Endenich. Clara ne fut pas autorisée à aller le voir mais Brahms si et lors d’une de ses visites, en février 1855, Schumann nota dans son carnet que l’op. 134 lui serait dédié. Brahms écrivit à Clara: «Vous savez tout le plaisir que votre mari m’a fait en me dédiant cette œuvre-là. Avec la Fantaisie pour violon [op. 131], c’est le concerto de lui que j’aime le plus.» Après la mort de Robert, l’année suivante, Clara cessa de jouer cette pièce; Brahms, lui, la joua à Vienne, en 1869. Als Robert Schumann im Alter von 18 Jahren aus seiner Geburtsstadt Zwickau nach Leipzig zog, um dort Jura zu studieren, war er sich noch nicht darüber im Klaren, was er mit seinem weiteren Leben anfangen wollte. Sein Vater, ein erfolgreicher Buchhändler, war zwei Jahre zuvor plötzlich verstorben und hatte Robert in seinem Testament 200 Taler im Jahr zugesprochen, falls er eine Universität besuchen würde (was seine drei älteren Brüder nicht getan hatten). Als einziges musikalisches Familienmitglied hatte Robert ab dem Alter von sieben Jahren bei dem städtischen Organisten, Johann Gottfried Kuntsch, Klavierunterricht erhalten, den er jedoch später als sinnlos beschrieb. So war er, bis zu seiner Ankunft in Leipzig, praktisch Autodidakt. Schumann war kein Wunderkind, trat jedoch mit seinen Improvisationen hervor—als Kind stellte er die Persönlichkeiten seiner Freunde in Musikporträts am Klavier dar. Man mag kaum glauben, dass er im Alter von 17 Jahren zum ersten Mal ein Sinfonieorchester hörte, und zwar in Dresden. Er musste das provinzielle Zwickau also verlassen und der Umzug nach Leipzig war sein Fluchtmittel. Die Tatsache, dass die Dame, in die er zu jener Zeit unsterblich verliebt war—Agnes Carus, eine verheiratete Sängerin, die acht Jahre älter war als er und mit der er die Lieder Schuberts entdeckt hatte—ebenfalls zu der Zeit dorthin zog, konnte nicht schaden. Schumann war sich jedoch darüber bewusst, beziehungsweise stellte er bald fest, dass er als Komponist seine Werke auch spielen können musste. Seine Zeitgenossen Mendelssohn, Liszt, Chopin und Thalberg waren alle Klaviervirtuosen, die das Publikum nicht nur mit ihren Werken, sondern auch mit ihrem Spiel beeindruckten. Kurz nachdem er in Leipzig angekommen war, begann Schumann, bei Friedrich Wieck Klavierunterricht zu nehmen, der ganz von vorne anfing und ihm langweilige Fingerübungen gab, die endlos wiederholt werden mussten. Schumann machte alles gerne auf seine Weise, so dass ihm dieser Ansatz sicherlich nicht leichtfiel. Ebenfalls schwer zu schlucken war wohl die Tatsache, dass Wiecks Tochter Clara im zarten Alter von acht Jahren bereits das a-Moll-Konzert von Hummel spielte, mit dem er sich selbst abmühte. Nachdem er zwei Jahre lang in Leipzig und Heidelberg Jura studiert (und zur Abwechslung eine Italienreise unternommen) hatte, stellte Schumann zum Missfallen seiner Familie schließlich fest, dass die Musik sein Leben bestimmen würde. Wieck nahm ihn als Vollzeitstudenten und Untermieter bei sich auf. Ein Jahr später jedoch trat in der rechten Hand Schumanns eine teilweise Lähmung ein, die heute wohl als RSI-Syndrom [repetitive strain injury: Verletzung durch wiederholte Belastung] diagnostiziert würde, damals allerdings noch nicht richtig erkannt wurde. Im Jahre 1832 wurde Schumann klar, dass er kein Pianist werden würde und sich damit begnügen müsste, einfach Komponist zu sein. Während dieser frühen Studienjahre hatte Schumann sich an einem Klavierkonzert probiert und die Solopartie eines Konzerts in F-Dur fast fertiggestellt. Außerdem hatte er sich darum bemüht, sein Opus 1, die Abegg-Variationen, in ein Werk für Klavier und Orchester umzuarbeiten, dies jedoch nicht vollendet. Heute wissen wir, dass er das Finale von Claras Klavierkonzert orchestriert hatte, das sie im Alter von nur 14 Jahren komponiert hatte. Zu Beginn des Jahres 1839, als Robert und Clara sich gegen den Widerstand ihres Vaters gegen ihre gemeinsame Verlobung auflehnten, versuchte er wiederum, während eines Wienaufenthalts, ein Klavierkonzert zu komponieren. Clara schrieb ihm ermunternde Worte aus Paris, wo sie sich auf einer Konzerttournee als letzte Verpflichtung gegenüber ihrem Vater befand: „Nimm mir es nicht übel, lieber Robert, wenn ich Dir sage, dass in mir sehr der Wunsch rege geworden ist, dass Du doch auch für Orchester schreiben möchtest. Deine Fantasie und Dein Geist ist zu groß für das schwache Klavier. Sieh doch, ob du es nicht kannst?“ Er machte sich an die Arbeit, schaffte es aber wieder nicht, das Werk zu vollenden. Seine Beschreibung des Versuchs ist allerdings prophetisch. Er nannte es „ein Mittelding zwischen Symphonie, Concert und großer Sonate“, was ebenso das Werk beschreibt, das später der erste Satz seines Klavierkonzerts in a-Moll op. 54 wurde. Im September 1840 heirateten Clara und Robert schließlich. Nachdem er jahrelang ein Meisterwerk nach dem anderen für Klavier solo komponiert hatte (seine ersten 23 Opusnummern sind Soloklavierstücke), wandte er sich mit großem Erfolg dem Lied zu und schrieb innerhalb nur eines Jahres 168 Stück. Neben seiner kompositorischen Tätigkeit gab er die Neue Zeitschrift für Musik heraus. Doch verdiente er damit kaum Geld und er wusste, dass es an der Zeit war, sich mit einem großen symphonischen Werk zu beweisen. Sein erster Erfolg auf diesem Gebiet war die „Frühlingssinfonie“, die er innerhalb von gerade einmal vier Tagen skizzierte und die am 31. März 1841 im Gewandhaus unter der Leitung von Mendelssohn uraufgeführt wurde. Offenbar war aber niemand an einem einsätzigen Werk interessiert. Trotz zahlreicher Anläufe ließ sich kein Verleger finden und das Werk wurde beiseitegelegt. Es sollten vier Jahre vergehen, bevor Schumann die Phantasie wieder aufgriff. Er setzte sich zumeist mit einem Genre für längere Zeit auseinander und 1842 war sein Kammermusikjahr. Das Klavierquintett op. 44 diente mit seiner virtuosen Klavierstimme als Pseudo-Konzert für Clara, die immer noch auf ein richtiges Klavierkonzert wartete. 1843 widmete Schumann sich großangelegten Chorwerken und im folgenden Jahr unternahmen er und Clara eine fünfmonatige Tournee durch Russland. Nach ihrer Heimkehr war Robert länger ernstlich krank und gegen Ende des Jahres 1844 zog er mit seiner Familie nach Dresden, in der Hoffnung, dort in Ruhe arbeiten zu können. Als Schumann sich schließlich wieder seinem Klavierkonzert zuwandte, komponierte er zunächst das Finale, den dritten Satz, den er als Rondo bezeichnete. Als er diesen Satz fertiggestellt hatte, schrieb er das Intermezzo, das den ursprünglichen ersten Satz (den er dann überarbeitete) mit dem Finale verbindet. Die Überleitung zwischen Intermezzo und Rondo scheint ihm erhebliche Schwierigkeiten bereitet zu haben (es existieren sieben verschiedene Fassungen). Heutzutage ist uns diese Musik so vertraut, dass man sich unterschiedliche Versionen kaum vorstellen kann, doch war der Schaffensprozess mühsam. In seiner hervorragenden Schumann-Biographie merkt John Worthen an, dass es nicht einer gewissen Ironie entbehrt, dass Schumann seiner Frau das Klavierkonzert zu einer Zeit überreichte, als sie kaum zum Üben kam. Sie hatte inzwischen drei Kinder und wusste, dass ein viertes unterwegs war (in 14 Jahren war sie zehn Mal schwanger), und weil Robert zum Komponieren Ruhe brauchte, konnte sie nur üben, wenn er seinen Nachmittagsspaziergang machte. Oft war sie dann aber schon so erschöpft, dass sie nicht mehr viel arbeiten konnte und sie gab daher nur sehr unregelmäßig Konzerte. Nun hatte sie aber endlich ihr Solokonzert und die erste Aufführung wurde am 4. Dezember 1845 im Dresdener Hôtel de Saxe gegeben. Ferdinand Hiller, der Widmungsträger des Werks, dirigierte das Orchester der Subskriptionskonzerte. Das Klavierkonzert war ein Erfolg, was auch in einer Rezension in der Allgemeinen Musikalischen Zeitung bestätigt wurde: „Wir haben alle Ursache, diese Composition sehr hoch zu stellen und sie den besten des Tonsetzers anzureihen, namentlich auch deshalb, weil sie die gewöhnliche Monotonie der Gattung glücklich vermeidet und der vollständig obligaten, mit großer Liebe und Sorgfalt gearbeiteten Orchesterpartie, ohne den Eindruck der Pianoleistung zu beeinträchtigen, ihr volles Recht widerfahren lässt und beiden Theilen ihre Selbstständigkeit in schöner Verbindung zu wahren weiß.“ Die zweite Aufführung (die oft irrtümlicherweise als Premiere angegeben wird) fand am Neujahrstag 1846 im Leipziger Gewandhaus statt. Es scheint Unklarheit darüber zu herrschen, wer zu dieser Gelegenheit dirigierte: einigen Quellen zufolge war es Mendelssohn, andere geben Niels Wilhelm Gade an, der die Dirigentenpflichten zu jener Zeit mit seinem berühmten Kollegen teilte. Wenige Werke vermögen es, das Publikum so schnell zu fesseln, wie dieses Klavierkonzert. Michael Steinberg beschreibt diesen Beginn besonders anschaulich: „Das Orchester gibt mit einer einzelnen Achtel (E) den Startschuss und sofort kommt das Klavier mit einer kraftvollen Kaskade vollbesetzter Akkorde aus den Startblöcken.“ Tatsächlich ist der Solist bei diesem Konzert fast ununterbrochen im Einsatz. Die Holzbläser spielen die Anfangsmelodie zum ersten Mal, in der das abwärts gerichtete „Clara-Motiv“—das in Schumanns Klavierwerken sehr häufig vorkommt—voll zum Ausdruck kommt. Es ist hier kein Tempowechsel vorgegeben, obwohl es „Tradition“ ist, etwas langsamer zu werden. Der nächste Klaviereinsatz mit dem Thema ist kraftvoll-expressiv und gleichzeitig innig. Der Dialog zwischen Klavier und Orchester ist kontinuierlich, wobei beide abwechselnd in solistischer und begleitender Rolle auftreten. Dies ist besonders bemerkenswert in der langsameren Passage, die mit Andante espressivo überschrieben ist, in der Mitte des ersten Satzes—ein zauberhafter Moment der Ruhe, wo Klarinette und Klavier als Solisten auftreten. Es ist interessant, den Klavierpart in dem zentralen Più animato mit dem zu vergleichen, was von der ursprünglichen Phantasie in a-Moll noch erhalten ist—die spätere Version ist deutlich schwieriger. Hatte Clara möglicherweise die mangelnde Virtuosität der Originalversion bemängelt? Die ausgeschriebene Kadenz ist perfekt ausgearbeitet und gab Clara Gelegenheit zu brillieren. Sie beginnt mit einem Kontrapunkt, durchschreitet mehrere rezitativartige Passagen, gewinnt bei einem fulminanten Akkordausbruch über absteigenden Oktaven enorm an Dynamik und kehrt dann mit großer Leidenschaft zu dem Anfangsthema zurück. Hier löst sich die Kadenz in einen Triller auf, endet nicht mit der Standardkadenz, sondern leitet direkt in den Orchestereinsatz über, bei dem das Thema sehr viel schneller, allerdings auch gedämpfter erklingt. Das Crescendo zu den letzten, kompromisslosen Akkorden hin ist höchst dramatisch. Ich werde nie vergessen, wie ich das Stück einmal für Schulkinder aufgeführt habe und ein kleiner Junge sofort nach dem letzten Akkord spontan mit einem „Wow!“ reagierte. Ich bin mir sicher, dass Schumann sich darüber gefreut hätte. Da Schumann als nächstes den letzten Satz komponiert hatte, ist es nachvollziehbar, dass der langsame Satz, als dieser schließlich entstand, nicht allzu gehaltvoll ausfallen sollte. Nach der Dramatik und den wechselnden Stimmungen des ersten Satzes scheint ein kurzes Intermezzo gerade richtig. Es wird hier das Motiv des ersten Satzes umgedreht, so dass es nicht mehr ab- sondern aufwärts gerichtet ist, doch wird der kammermusikalische Charakter beibehalten und sogar noch verstärkt. Die Klarinette nimmt wieder eine exponierte Stellung ein und den Celli wird eine große Kantilene übertragen. Dieser Mittelteil wird nur allzu oft etwas verzerrt und gefühlsschwelgerisch dargestellt, anstatt die Vertraulichkeit beizubehalten. Die Überleitung vom Intermezzo zum Finale, für die Schumann sich letztendlich entschied, kehrt zu dem „Clara-Motiv“ zurück, zunächst in Dur, dann in Moll, bevor sie in das Thema des Allegro vivace hineinbricht. Hier sorgen die aufsteigenden Figuren für eine Stimmung uneingeschränkter Freude. Meiner Meinung nach wird dieser Satz oft zu schnell genommen; Schumanns Metronomangabe von einer punktierten Halben = 72 ist ausnahmsweise einmal völlig passend, besonders wenn man den walzerartigen Charakter des Stücks herausarbeiten möchte (insbesondere die Coda ist sehr schwungvoll). Meine allererste Aufführung dieses Klavierkonzerts war bei der Endrunde des Schumann-Wettbewerbs in Zwickau (Schumanns Geburtsstadt) 1976. Der Dirigent des Orchesters aus Halle ließ es nicht zu, dass die Finalisten diesen dritten Satz zu schnell nahmen und es ist mir bis heute lebhaft in Erinnerung, wie er sich zu mir herüber lehnte und derart furchterregend den Takt schlug, dass es völlig unmöglich war, schneller zu spielen. Alle Figuren im Klavierpart müssen singen und gehört werden. Das Herumgehusche (so klingt es jedenfalls oft) in verschiedenen Tonarten an der schwierigsten Stelle des Konzerts—wo Schumann ein Musterbeispiel seiner geliebten rhythmischen Spielereien einfügt, die alle Dirigenten fürchten, offensichtlich sogar auch Mendelssohn—muss leicht und zusammenhängend klingen. Und tanzbar. Doch was für belebende Musik es ist. Clara musste lang auf dieses Stück warten, doch hatte sich das Warten letztendlich gelohnt. Es ist interessant, dass Schumanns Werke für Klavier und Orchester jeweils im Abstand von etwa vier Jahren entstanden: die Phantasie im Jahre 1841, die übrigen Sätze für das Klavierkonzert im Jahre 1845 und zwei Einzelstücke für Klavier und Orchester jeweils 1849 und 1853. Die Skizzen für die Introduktion und Allegro appassionato op. 92 fertigte er innerhalb von nur zwei Tagen im September 1849 an und die Partitur vollendete er eine Woche später. Clara stürzte sich gleich darauf, doch war sie bei der Premiere im Februar des folgenden Jahres in Leipzig indisponiert, so dass das Ganze ein Flop war. Die zweite Aufführung hingegen, die sie einen Monat später in Düsseldorf zusammen mit ihrem Mann am Dirigierpult gab, war ein großer Erfolg. Trotzdem wurde es dann einige Zeit lang vernachlässigt, was schade ist, da allein die zauberhafte Einleitung das Werk schon hörenswert macht. Schumann hatte sich zu der Zeit in die dramatische Dichtung Manfred von Byron vertieft (woraufhin seine Manfred-Ouvertüre entstand) und jene eindringliche Verzweiflung kommt auch in dem Anfangsthema des Allegro zum Ausdruck. An einer Stelle kehrt das Thema der Einleitung in H-Dur in einer Passage wieder, die (besonders, wenn man sie aus dem Zusammenhang herausgenommen hören würde) sehr nach Brahms klingt. Schumann hatte den jungen Brahms allerdings noch nicht kennengelernt. Er sollte einige Wochen nach Claras 34. Geburtstag im Jahre 1853 vor der Haustür des Schumannschen Haushalts erscheinen. Robert hatte Clara nicht nur einen neuen Flügel geschenkt, sondern auch das Manuskript seines neuen Konzert-Allegro mit Introduktion op. 134 daraufgelegt. Ihre Freude darüber war grenzenlos. Die kurze Einleitung beginnt mit Pizzicato-Akkorden des Orchesters, die das Klavier mit einem lyrischen Thema im Dreiertakt unterbricht, das dann im Allegro mit einer hinzugefügten Zählzeit wiederkehrt. Im Allegro wird vom Klavier ein neues Thema vorgestellt, das von einer solchen Zärtlichkeit ist, wie nur Schumann sie hervorbringen konnte. Eine ausgedehnte Kadenz nimmt fast ein Viertel der Gesamtlänge des Stücks ein und ist eine wunderschöne Rhapsodie mit demselben Material, das bereits erklungen ist. Die ersten Aufführungen des Werks wurden in Holland (Utrecht, Den Haag, Amsterdam) im November und Dezember 1853 von Clara und Robert am Dirigierpult gegeben. Weniger als drei Monate später beging Robert einen Selbstmordversuch, indem er sich in den Rhein stürzte, woraufhin er in die Heilanstalt in Endenich eingeliefert wurde. Clara durfte ihn dort nicht besuchen; Brahms jedoch fuhr zu ihm und während eines Besuches im Februar 1855 schrieb Schumann in sein Notizbuch, dass das op. 134 ihm gewidmet werden sollte. Brahms schrieb an Clara: „Wie hoch Ihr Mann mich durch die Widmung, gerade dieses Stückes, erfreut, das wissen Sie wohl. Das und die Violinfantasie [op. 131] sind mir die liebsten seiner Konzerte.“ Nach dem Tod ihres Mannes im darauffolgenden Jahr spielte Clara das Werk nicht mehr öffentlich; Brahms führte es jedoch im Jahre 1869 in Wien auf.